A month ago I started a new job. This is a big deal for me because I’d been in at TransportAPI for eight years. But time for a new job in 2018! I’ve just started at OpenCorporates. OpenCorporates provides company listings data. It has a database of corporate entities, rather like Companies House in the UK, but bringing together this and similar datasets from countries all around the world. Now “company listings data” may sound rather dull, but there’s a couple of aspects of this which I think are quite exciting: open data and… fighting crime and injustice! At one stage the Companies House website was only open during working hours (Yes. Hilariously the website’s clunky querying interface stopped working after 6pm!). Aside from making itself a target of general ridicule from tech people, companies house also became a target of the emerging “open data” campaign at the time. About a decade ago the guardian “Free Our Data” column was leading the march, campaigning for data releases. I also remember attending a “National Hack the Government” event hosted by the guardian, with all sorts of hijinks of civic hacking tech people who were producing better versions of government websites and, if necessary, taking data by force (brute force scraping) to do so. From these kinds of mischievous beginnings OpenCorporates was born. I remember bumping into Chris Taggart at various conferences and events around this time, while I was generally running around beating the OpenStreetMap drum. Later I ended up working with TransportAPI, and TransportAPI ended up sharing an office space with OpenCorporates at the Open Data Institute for a while. Companies House went on to get their act together considerably (spurred on by those early civic hackers no doubt). Meanwhile OpenCorporates continues to campaign for open data releases from other governments around the world. My point is, OpenCorporates is very much historically and currently part of the open data movement. I regard any open data work as a kind of “social good”, but if you think about it, company listings are really a flagship example of the kind of dataset any government absolutely should be making public and easy to use. This brings me onto the other aspect. A more dramatic kind of “social good”. OpenCorporates, by making company listings data more available, is fighting crime and injustice …if a little indirectly. A “registered company” might be a high-street shop or some other real-world bricks-and-mortar thing, but often not. Registered companies are legal and financial constructs which get used and abused in all sorts of ways. We see examples of dodgy dealings on any episode of “rogue traders” where it invariably reveals how bad people closed down a company, and re-started under a new name to shake off the authorities. It’s clearly too easy to get away with. Company listings data provides a little bit of an antidote by helping with transparency and knowing who you are doing business with. But that’s just small time fraud. 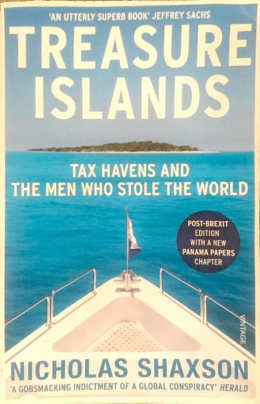 When I started at OpenCorporates they gave me a copy of the book “Treasure Islands: Tax Havens and the Men who Stole the World” by Nicholas Shaxson. It describes tax avoidance, tax evasion, money-laundering, and flows of criminal funds enabled by offshore “secrecy jurisdictions”. It builds up a picture of this as not just a side-show by a dishonest minority, but widespread deeply embedded system of corrupting influence benefitting the rich and powerful, at the expense of everyone else. The problem feels unsolvable as we realise that the corruption runs deep within all of our governments. It’s a pretty eye-opening and pretty horrifying book! The book details some specific financial tricks and loopholes, but generally the idea for a global company (or crime syndicate, or just a wealthy individual) is to have your accountants and lawyers create a tangled web of different corporate entities registered in different jurisdictions, with maximum secrecy making it almost impossible for tax authorities or financial regulators to pin down your assets, profits, risks, and capital. There are many layers of financial trickery, but it’s clear that corporate registrations are the key vehicle for this kind of skullduggery. As such, data on registered corporate entities is vital. It doesn’t solve all the problems of financial secrecy. Investigators will need to piece together a lot more about companies, their assets, the true owners and beneficiaries, and their links with other entities, in order to cut through the information void created deliberately to bamboozle them. But it’s a start. Company listings form a kind of information bed-rock upon which other information and investigation can be built. Whether it’s an investigative journalist looking to crack open a high profile case, or a tax authority, or a just somebody looking to establish the trustworthiness of a company, OpenCorporates helps enable this important work. It puts the information out there more publicly and in more useful formats to help shed a little bit of light on this murky world of crime and tax dodging. Maybe “fighting crime and injustice”, is a super-style exaggeration. Folks like the Tax Justice Network are tackling this big problem more head on, but OpenCorporates helps chip away at the problem with a more bottom-up data-oriented approach. So I’m getting my head into this new subject area, and joining OpenCorporates as a software engineer. It’s primarily Ruby on Rails development, but with lots of infrastructure and data processing challenges. Fun stuff! We’re based in the main pointy tower at Canary Wharf. We just had our office warming party in a new place 42 storeys up. If you fancy joining me there, we are hiring back-end engineers, infrastructure engineers, and data analysts. Check out jobs.opencorporates.com!